PHILADELPHIA: Cigna launched an integrated national campaign July 16 to reinforce its rebranding as a health services company using media outreach and promoting a new interactive Web site. 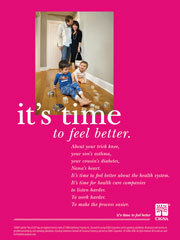 The campaign, called "It's time to feel better," is aimed at a consumer audience, although media outreach has included some b-to-b and trade publications, said Gloria Barone Rosanio, director of corporate communications at Philadelphia-based Cigna. She added that while the national healthcare landscape is changing, Cigna wants "to reinforce the message of change" and simplify the healthcare process. Three years ago, the company began to brand itself as a health services company and away from a health insurance company, said Rosanio. Fleishman-Hillard is providing media relations, event planning, and assistance with a new online news hub that will complement Cigna's current online newsroom. PR budget was undisclosed, though the entire effort, including ads and marketing, is a multimillion initiative, she added. The Web site for the campaign, itstimetofeelbetter.com, provides questions to ask a doctor, stress quizzes, and other health-related advice and educational tools. A social media drive is slated for September, although Rosanio said no additional information was available. The ongoing effort will include ad and marketing components to "fully support our new brand platform," she said. A national business press push is planned for later in the year. In June, Cigna launched a pilot version of the effort in Denver, where the company recently acquired Greenwood Village, CO-based Great-West, an employer-sponsored retirement savings plan provider. PR included wellness events, held at a local park throughout the summer, that offer tai chi and yoga classes, and healthy cooking lessons.